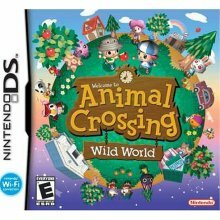 With Animal Crossing’s sequel for Wii, City Folk, coming, we can bet that a lot of fans are back to playing Wild World, trying to experience again the feel as they wait for City Folk to be released. A lot is to be expected from City Folk, but we have to be reminded that City Folk would not be possible without the success of good, old Wild World. A lot of the features that made the series popular were pioneered in the DS edition. Let’s look into a few reasons for Wild World’s success. You may see a lot of new stuff in Wild World, but it still has the basic idea of living in a village. Wild World is very non-linear and you can practically do anything you want anytime you want like talking to the villagers, collecting items, planting flowers, and a lot more. The village you live in is really a village. There are a lot of places to go to and each has something to do when you are there. For example, you can donate fossils to the museum and your donations would be displayed there. The game is very customizable. There are options to customize and decorate your house anyway you want. Adding rooms, furniture, decorations, themes- it’s all there. The game uses the features of the Nintendo DS well. Touch screen controls for movement and interaction, dual screen using the top to display the sky and the bottom to display the environment, internal clock for events, and Wi-Fi Connectivity to connect with players all around the world. Online play brings this game to life. Wi-Fi Connectivity allows you to visit a friend’s village, compete in mini-games, and a lot more. Animal Crossing: Wild World has no doubt brought players a virtual world they can enjoy and indulge in. And thanks to Wild World, we will be seeing more from this great series in City Folk. Pokemon Black DS Rom - 5th generation Pocket Monster games are released.